For years, veteran climbers, new members and eager students have enjoyed what has now become something of a SAC tradition, the annual Ice Climbing weekend on Mt. Hood. This year, six of us escaped the August heat in the valleys and chilled out in the cool environs of Mt. Hood’s White River Glacier. It was a great day for ice climbing. 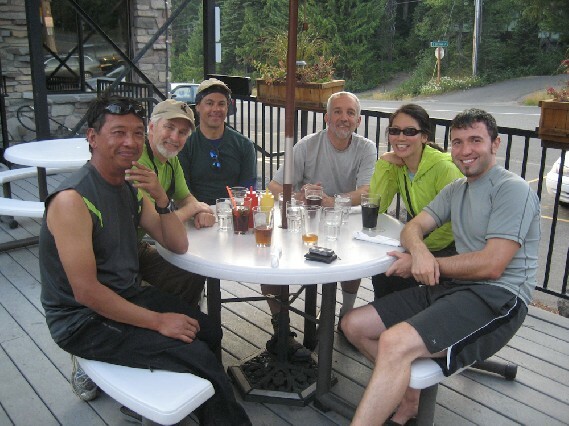 Meeting at Timberline as 6:00 a.m., Doug Adair and Kipp Bajaj guided Jenny Wang, Peter Tuzon, Mark Barnard, and Jeff Schwindt (the new “Guy”), up the south side of Mt. Hood to a point near the top of the Palmer chair lift then east to the White River glacier. 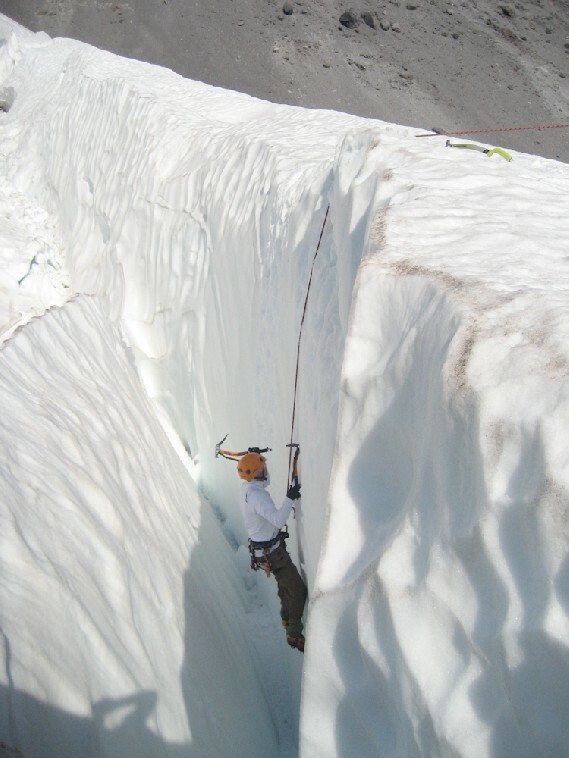 There we found several sites that were well suited for rookies to learn two ice axe and crampon front point climbing techniques. 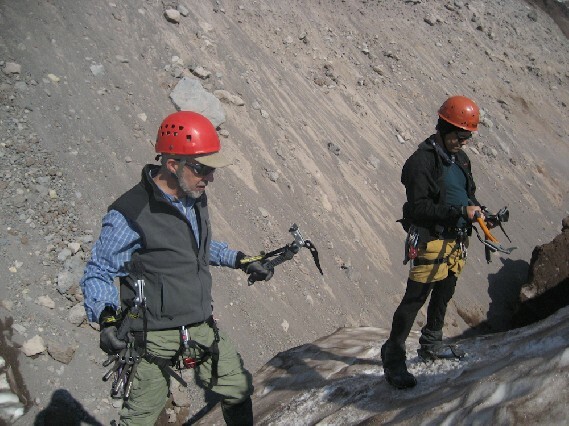 Doug and Kipp have been climbing together for years and have a relaxed and humorous way of sharing their wealth of experience with a group of students. Doug started us off with covering some basic information on equipment, safety and techniques while Kipp set up an anchor and top rope. 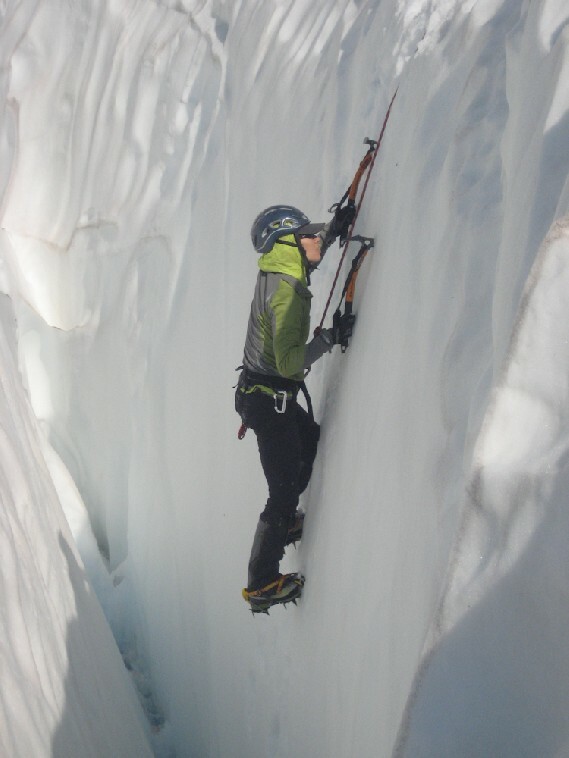 We then strapped on our crampons, grabbed our ice axes and started the fun. After a couple hours of practice, we broke for lunch and surveyed other areas on the mountain where we could go next. We decided to climb higher on the glacier in search for blue ice. To get there we had to briefly climb up a scree field. This proved to be the hardest climb of the day. With all the loose rock, it was two steps forward and one step back. We had to simultaneously ascend the scree six abreast so no one would be pummeled by the loose rock that careened down behind us as we worked our way out of this dusty taste of hell. 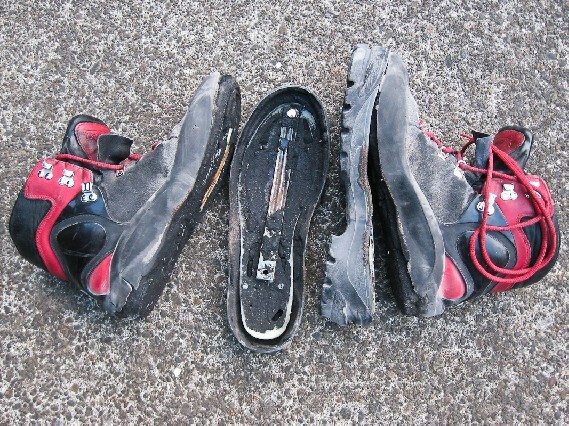 It was about this time, that Doug realized that the boots he was wearing and had worn for years and dozens of climbs and summits, both decided to give up the ghost and start falling apart at the same time and in the exactly same way. His climbing for the day was over, so he told us to meet him in the parking lot in a couple hours; then as he started down the mountain we continued up. It didn’t take us long to find a great spot with a v-shaped crevasse in which we could practice. We all took turns belaying one another and practicing using two tools and our crampons as we scaled down and up the walls of the crevasse. All too soon, it was late afternoon and we all agreed it was time to call it a day. So, holding true to the SAC slogan that says we are a “drinking club with a climbing problem”, we headed down to Timberline, met Doug and drove down to Government Camp to enjoy a good meal and a glass of beer, or two, at the Ice Axe restaurant and Brew Pub. Amongst the group, we sampled all but one of the beers they brew there. It was a relaxing way to end a great day on the mountain. 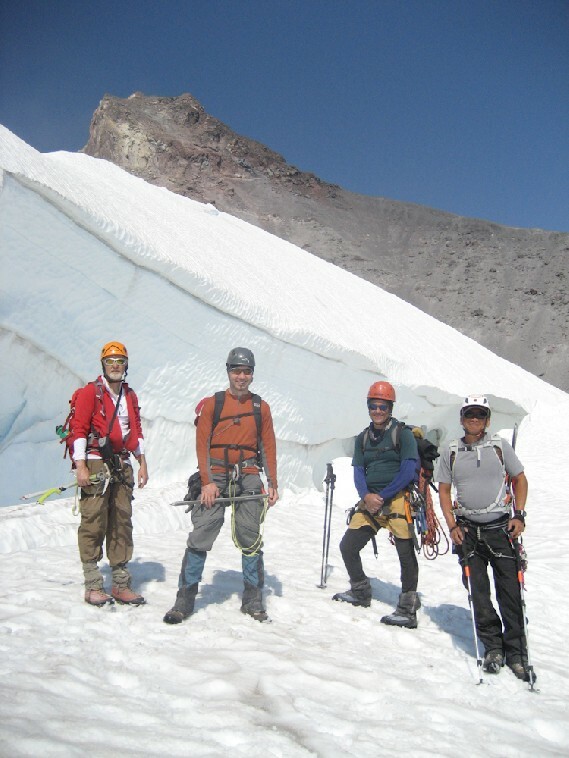 We are fortunate to have Doug and Kipp in our club and that they are so willing to share their considerable climbing experience, and great stories, with new members. Their help in making this event an enjoyable learning experience was appreciated. 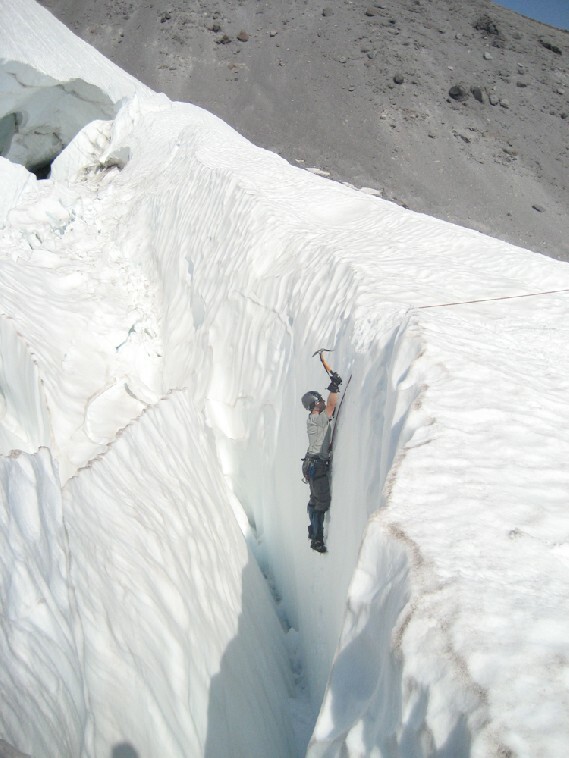 If you haven’t had a chance to do some ice climbing, join us next time. It is really a lot of fun.